In the spring of 2015, Nepal was struck by massive earthquakes and the resulting aftershocks. Arjun was one of the many affected in Kathmandu, which is a populous city and was very close to an epicenter. A migrant from Sindhupalchowk, Arjun was living with his family of seven in Kathmandu. When the earthquake hit, Arjun and his family rushed to one of the open areas in the city. It was a moment full of turmoil and fear. Afterwards, he was simply thankful to have survived the biggest tragedy in the nation, which killed nearly 10,000 people and affected 8 million. Soon he and his family moved into a small tent in the Chuchepati camp site. As aftershocks continued to hit the area, Arjun and his family planned their next steps. 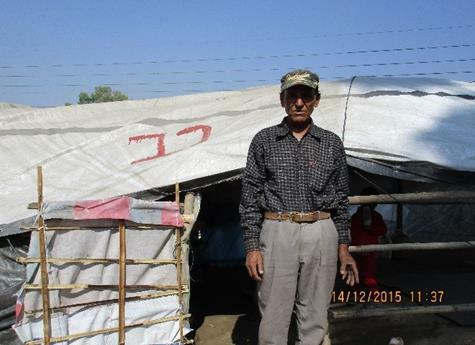 Since their house in Sindhupalchowk had been destroyed completely, the family had no choice but to stay in the camp. The future looked bleak; without a job and adequate support, he felt confined in the small tent in which he was staying. When TB screening programs began in the camp site, Arjun felt at first that it was just adding to his misfortune. Ten years ago, he had been very ill with TB and nearly lost his life to the disease. The screen was an unwanted reminder of difficult times, and he was hesitant to get tested. The team organized by the IOM and partners encouraged him to submit a sample for testing, due his past experience with TB. For Arjun and about 500 others, GeneXpert technology was employed with high accuracy, finding cases of TB missed by conventional tests. He was shocked when he received the positive diagnosis. He was enrolled in treatment at the nearest DOTS center immediately. IOM, working with the NTP in Nepal and other partners, employed contact tracing to Arjun’s family. Most tested negative, but his eldest son was also positive. He, too, enrolled in treatment. Arjun was grateful the TB was caught before anyone else got sick. “Without this program I would have never known that I have this disease, and I would have spread it to all,” he says. They were among 17 others on DOTS through IOM Nepal in 2015. Despite the challenges presented by the earthquake, IOM Nepal continued to spread education and treatment for TB. Over 7,000 displaced individuals like Arjun received awareness sessions, and another 7,598 displaced persons were screened. Furthermore, 243 female community health volunteers were trained to help detect and treat TB. These measures will work to prevent the spread of TB as the country rebuilds.